When devising a final project for a BTech Traffic Statistic class, lecturer Shaheed Mahomed drew inspiration from a project close to home. 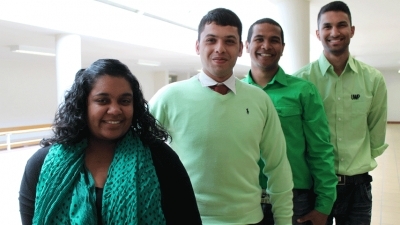 He tasked students with conducting a critique of CPUT’s proposed student shuttle service and present their findings at the annual BTech Traffic Statistics Conference. With more than 33 000 students situated at several sites across the Cape Peninsula, the proposed shuttle service will encourage the collaboration of the different campuses and faculties and create a landmark transport system. The project saw students conduct questionnaires at the various campuses. They also compared the proposed shuttle service to similar services at other universities and explored elements such as cost and the proposed routes. Students put together excellent presentations, but it was Carmel Petersen, Shuaib Falal, Ridwaan Adams and Taabish Samaai who walked off with first prize for their team’s efforts. Team leader Taabish says the project was relevant especially to those students who are already working in industry. “It was a good experience to work in a team on a project of this nature,” he says. Wim Ferreira of Transport Consultants TECHSO Western Cape, who judged the presentations, says he was impressed with the quality of work presented by students as well as their presentation skills. “Once in industry students will have to be able to communicate with clients. I think it is an excellent strategy as part of the students learning experience to encourage group work and present their project outcomes,” he says.